Their route to the finals has been nothing short of impressive. France set a new record with 14 wins from 14 matches in this year’s FIVB World League. The display in the final round of matches in Varna was a demonstration of strength. “France gave us a lesson in how to play volleyball. They did everything on court, we did nothing. Their serve was good, but this is only one of the elements. The fast attack worked well, the defence-block system too,” said a visibly impressed Julio Velasco, coach of Argentina and the man who led Italy to two World Championship titles in 1990 and 1994 and five victories in the FIVB World League. In the final, France outclassed hosts Bulgaria 3-0 (25-16, 25-20, 25-21), despite the home team being cheered on relentlessly by its fantastic fans. “France were three times better than us and deserve to go to Rio,” said Bulgaria’s Teodor Salparov. Victory over Bulgaria was the 14th win in a row for the “Unbeatables”, who are overflowing with confidence. Captain Benjamin Toniutti: “It's never easy to play in Bulgaria, we lost every time here. But this time we produced an incredible level of play.” This moment helped to delete the bitter memories of last year when, after an impressive preliminary round, France suffered a shock defeat to Australia in the final of Intercontinental Group 2. And another magnificent display at the FIVB World Championship ended with a disappointing fourth place, as the team struggled to produce its best volleyball in the finals. This year is a different story, however, as the success in Varna has showed. “I feel relieved after such a big investment on the part of players and staff. I knew we had the spirit and commitment to come through. I confess to being a little surprised at this result, both 3-0 victories, but it backs up our fourth place in the last World Championship. The goal now is to go even higher than fourth,” said coach Laurent Tillie. He has moulded a real team out of stars like Earvin Ngapeth, Kevin Le Roux and Antonin Rouzier. 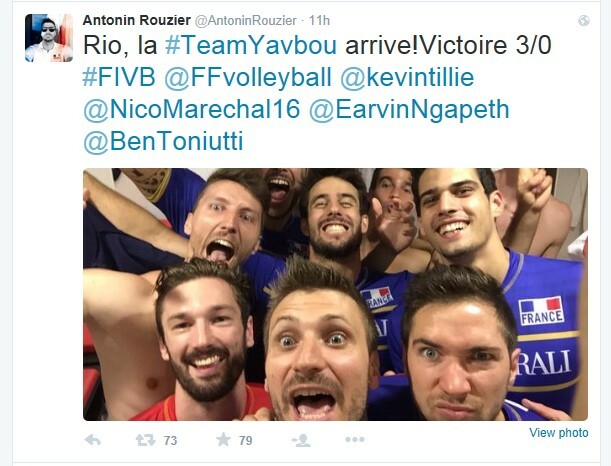 Tillie was particularly full of praise for Rouzier, the top scorer after the final against Bulgaria: “It is very beautiful to see him play because it is total volleyball.” This goes for the entire team at the moment, as they look for a return to the glory days of French volleyball. The French finished third in the FIVB World Championship in 2002 and have claimed silver at the CEV European Championships on four occasions. The team also finished runners-up in the 2006 FIVB World League, losing out to Brazil 2-3 in the final. Wednesday presents an opportunity to make amends for that defeat and for the semifinal defeat at the FIVB World Championship last year. After a long journey from Bulgaria, France will take on hosts and favourites Brazil in the opening match of the Finals in Rio de Janeiro’s Maracanãzinho. Their other opponents in the first round are defending champions the USA. It doesn’t really get much tougher than this, but France are without doubt one of the strongest teams in the world at the moment. And there is no doubting the optimism and confidence in the French camp, as Earvin Ngapeth revealed. “In Rio, the goal is clear: the podium,” said coach Tillie. You certainly wouldn’t put it past the “Unbeatables”.